AJ bazooka banal, Tyson cave, live streaming pinoy pride 7 winner fight results, video replay fight aj banal tko knockout tyson cave, aj banal wins unanimous decision, tyson cave; wins over aj bazooka banal, tyson cave vs aj banal fight video replay, hoops doom, lapu-lapu city, july 30,2011, winner of pinoy pride 7 live results, wins tyson vs banal. This page is intended for the fight results and winner of Pinoy Pride 7 AJ Bazooka Banal VS Tysoon Cave Held at Hoops Dome, Lapu-Lapu City this July 30, Saturday, 2011. Any updates of the result including videos and fight articles will be posted here. Update: AJ 'Bazooka' Banal retained his WBO Asia-Pacific Bantamweight title against Tyson Cave via an 8th round technical decision in Pinoy Pride 7: Battle at Mactan. See Video Replay and Fight Results Below. Banal was able to win despite having trouble with Cave's unorthodox style and antics.The official time was 2:32 of the 8th round. All the judges gave the bout to Banal, with scores of 79-73, 78-74, and 78-74. Aj Banal managed to keep cool agains the cocky Tyson "Caveman" Cave. AJ's attitude was not the best one either. The fight was already over. However, it's understandable AJ's frustration as he has never seen anything like it. As humans sometimes we feel that there is a limit to this kind of behavior. But the good kid AJ Banal must try to always keep his cool and calm as the gentleman that he is. As for Tyson "The Caveman" Cave, hopefully he will not be invited to fight in the Philippines ever again. "Cave wanted the Cebuanos to remember him; this fight sealed his infamy." Most fans at ringside could not agree more. Aj Banal Wins against Tyson Cave via *th round Technical Desicion. Romeo Jakosalem defeats Eusebio Baluarte via round one TKO. Lorenzo “Thunderbolt” Villanueva defeats Eddy Comaro via round one TKO. Michael Domingo defeats Richard Samosir. Michael 'Bruce Lee' Domingo won by TKO at the end of the sixth round in his fight against Richard 'King Cobra' Samosir of Indonesia. Samosir tried to fight from a distance and establish his long jab. But Domingo landed the harder blows. Samosir decided to fight back in the 6th but Domingo still dominated the round. Samosir signalled that he had enough at the end of the 6th and his cornerman left him in the ring, disgusted with his decision to quit. Lorenzo 'Thunderbolt' Villanueva fired a series of left hooks to the body and head of Eddy Camaro. The Indonesian crumbled and took the ten count on one knee. Official time – 1:02. Camaro went the distance before losing on points to Jason Pagara last January 2010. The unbeaten Villanueva now has 21 wins, 20 by knockout with one no contest. Romeo Jakosalem decked Eusebio Baluarte three times, two were recognized by the referee. 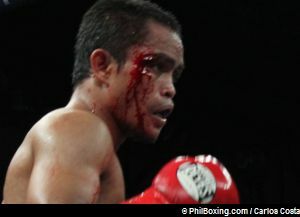 He continued to pummel a dazed Baluarte prompting the stoppage at 2:53 of the first round. Albert Pagara remained unbeaten and score a 'highlight reel' knockout of Jaime Alin,Jr in the third round. A powerful right uppercut sent Alin out of the ring and he hung on the ropes unable to get back in. Official time – 1:50. Jonathan Refugio gave a boxing clinic and won an eight round unanimous decision victory over Jomar Cordinillo. Refugio, a slick southpaw from the Sajulga Stable, used his lateral movement effectively and landed sharp accurate counters. Cordinillo tried to press but missed more than he landed. He was also penalized for low blows in the second. The scores – 76-75, 77-74 and 78-73. Jun 'Flash' Intor beat Cris Leon by majority decision. Intor strutted his usual comedy act but Leon did not want any part of it and landed hard straight punches. Intor realized that he was in a real fight and fought just enough to survive. The scores 38-38 and two judges had it 39-37 for Intor. In the opening bout of the evening, Ryan Maano needed only 43 seconds to dispose of Yoshinobu Arai of Japan. A one-two combo sent Arai down and Maano continued to rain punches on the Japanese when he got up. The referee stopped the fight with Arai trapped on the ropes.